What are the staples of your diet? What is essential? A well-balanced, nutritional diet is important to a healthy physical, mental, emotional and spiritual life. And I don’t mean only the food we eat. Food is important, of course. For me, there’s fruit such as pineapple, cantaloupe, grapes, bananas – I love to eat those at some point of the day. I like vegetables a lot, too: green beans, carrots, peas, corn. Since I don’t always have enough, I’ll drink a V8 with lunch many days. I like to have meat in there somewhere, especially if I eat fast food. Stopping at a restaurant also means I usually have some form of a potato dish. I love potatoes. Contrary to popular opinion, Diet Coke and cookies are not essential parts of my daily food intake. I just like them – a lot – so I have them a lot. Just rarely at home. Eating out is a different story. My favorite restaurant is Panera Bread Company, mainly because the food is good, I can (if I choose to) eat healthy food there and it’s a great value for the money. My favorite meal there is a cup of black bean soup and a half-order of the barbequed chopped chicken salad: 375 calories and less than 10 bucks. Oh, and there is bread. I like the soup, like the salad but … ah, the bread. 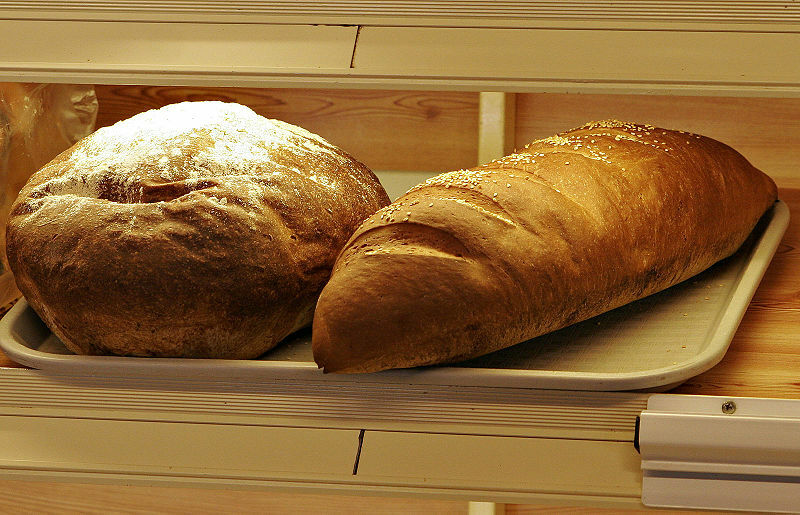 A big chunk of it – a whole grain baguette. They give you a choice for a side with my favorite meal. I could choose an apple or a bag of chips. But I’m all over the bread, despite the 180 calories and the fact that many diets demand a limit to bread. Bread is one of the staples of my diet. I simply can’t eat all the stuff for a sandwich without bread or a hamburger that is just the meat. I crave the bread. We can speculate on exactly what he meant with that petition. It could well have been more than simply bread but that we should ask God to provide adequate food for the day. And soon enough, Jesus gave his disciples and his entire Church a new kind of bread. Living bread, which still looked like something made with grain but actually was his very Body. 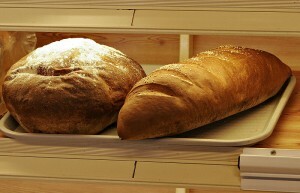 For me, physical bread is an important part of my daily diet. And even though I’m not able to get to Mass each day, I truly have a hunger for the Eucharist and find unspeakable spiritual satisfaction when I am able to receive Holy Communion. Those of us who suffer from depression have other daily requirements that should be as much a staple as whole grain bread. There’s medication; most of us have prescriptions for at least one anti-depressant to take daily. All the other essentials can vary from person to person. Some possibilities: Regular therapy sessions with a counselor. Exercise or at least some bit of physical activity. A shower. A conversation with a family member or friend. Playing with a pet. I know a woman who de-stresses by coloring pictures. Finding a purpose in each day can be essential, so that could mean working eight hours a day or volunteering or simply performing an act of kindness. And there is prayer. That is a necessary part of my daily diet. I need to find extensive time every day – every single day – to sit and chat with God. Sometimes, I talk. Sometimes, I listen. And sometimes, well, I’m just there in silence and come to understand better that God loves me, that He wants to help carry my cross of depression in order to lighten my load and ease my suffering. If I don’t pray, I might as well not eat because my spiritual self will wither just as my physical body will suffer if I don’t eat properly. I found some research that indicates the history of bread in human history stretches back at least 30,000 years, primarily in flatbread form as flour was probably processed into an unleavened bread. Cereals and bread developed into a daily staple about 10,000 years ago. Despite widespread advice in some circles to reduce eating bread based on nutrition and dieting, the World Health Organization still recommends eating bread several times each day, a total of about 4-8 slices. Just as bread can and should be a part of a well-balanced physical food diet, prayer should be part of a well-balanced life overall. Don’t dismiss the help spiritual development can provide to the physical, mental and emotional aspects of life. So now is a great time to increase your awareness of depression – either your own or that of others around you – and assess what your “daily bread” should be. Examine your life and lifestyle. Make a list of what helps. Then, ask for those things in prayer. God will provide.